Thunderstorms can be extremely stressful for cats. While cats may not show their fear in quite the same way as dogs (in severe cases of thunderstorm anxiety, panicking dogs have been known to destroy furniture, jump through windows or otherwise harm themselves during storms,) they may still become extremely anxious. Behaviorists are not sure which part of the storm frightens pets the most – the lightning flashes and thunder, the winds blowing around the house or the sound of rain hitting the roof. Some pets even show signs of anxiety an hour or more before a storm hits, leading to the theory that they are reacting to changes in barometric pressure. Cats will usually hide from the disturbance under beds or in dark, quiet corners. Unlike dogs, they tend to not progress to the phobic stage – they simply wait out the storm in their safe place and come out of hiding when the storm has passed. But there are some things you can do to help your cat feel safe during storms. If your cat usually hunkers down under the bed or in a closet, you may want to provide some additional comfortable hiding spaces.“Igloo style” cat beds can be a great option. If you keep these types of beds in areas where you and your cats spend a lot of time, they may use them to hide from the storm rather than cowering under the bed. Remedies such as Storm Soother or Rescue Remedy, given before a storm moves in, can help keep kitties calm. Pheromone plug-ins such as Comfort Zone with Feliway can also help – use in the area where your cat tends to hide during storms. Our cats pick up on our emotions, and if we’re anxious, they’ll be anxious as well. Reassure your cat, but don’t overdo it. While it’s tempting to cuddle and comfort your cat during a storm, in your cat’s mind, this rewards the fearful behavior. The Thundershirt anxiety wrap, a pressure wrap that is intended to provide a calming effect, works for some cats. Given that very few cats enjoy being swaddled or held close, I’m not sure I’m sold on the concept. 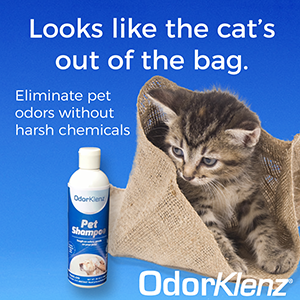 If you decide to try it for your cats, you will need to get your cat used to it before a storm. If you live in an area where thunderstorms are a regular occurrence for long periods of time, you may consider desensitization. This approach gradually retrains your cat by exposing her to gentle reminders of a thunderstorm such as a recording of distant thunder, and rewarding her for staying calm. The idea is that over time, the response to the stimulus decreases. For severe cases of thunderstorm anxiety, a visit to your veterinarian is in order. Your veterinarian can prescribe anti-anxiety or anti-depressant medication to help keep your cat calm during storms. Allegra was very scared of thunderstorms when she was little. She still goes to her safe space (behind the shower curtain in our downstairs bathroom) during storms, but she’s not nearly as stressed as she used to be. I think Storm Soother has made a big difference for her. Ruby, on the other hand, is fearless. She’ll sit by the windows even during really bad storms and watch the rain and wind. I have a mild thunderstorm phobia, and I have to be very mindful of my own energy around the girls during storms – I’ve been known to take liberal hits of Storm Soother myself! Are your cats afraid of thunderstorms? What do you do to help them? *The Conscious Cat is a participant in the Amazon Services LLC Associates Program, an affiliate advertising program designed to provide a means for us to earn fees by linking to Amazon.com and affiliated sites. The Conscious Cat is an affiliate partner of Jackson Galaxy. This means that if you decide to purchase through any of our links, we get a small commission. We only spread the word about products and services we’ve either used or would use ourselves. My two cats that I got from the humane society years ago are calm but the two cats I rescued from outside, run to the basement as soon as they “Hear” thunder even if it is feeding time! They will dissappear until the thunder stops, next time I Know a storm is about to start I’ll give them each a spray and see what happens. Both my indoor cats don’t like thunder n especially the fire works n r 2 dogs as well. I’ll have to give that soothing remedy a try. Maybe it will work for all pets. The remedies do work for dogs as well, Debbie. Let me know how yours do if you decide to try it. Fortunately both Katie and Waffles don’t seem to be affected by even loud storms. But for any stressful situations, I always try to make sure they have a safe place to hide. ….I’m a big believer in the natural remedies you’ve recommended too! I’m so glad the remedies are working for Katie and Waffles, Debbie. This is good information, especially with July 4 just around the corner, too. We are lucky that we have daily storms that have mostly desensitized us here. Unless there’s a nearby lightning strike (in which case even the humans should hide! ), we are pretty calm about the whole thing these days. Mine are pretty good until it gets real loud. Garfield is the worst one as he does hide.I think he feels safer under the chair. The others just get the really big eyes and are on alert mode. They usually hate the tornado siren worse. Our cats don’t like thunderstorms, usually finding their comfy hidey places to ride them out. Fireworks, however, make them quite nervous. During the summertime, there are bombs and cracks almost every night, and it’s hard to predict when they will happen. We just keep an upbeat attitude, and don’t try to pry a hiding cat out of her preferred safeplace until afterward. Fireworks do seem to be worse than thunderstorms. Even Ruby, who is mostly fearless, is afraid of fireworks. My first cat, Abby, a gray Persian I actually found in my local shelter. would hide under the bed during storms. At some point, probably after the storm had passed, she would fall asleep under there, and I would wake up during the night and hear her snores coming from underneath. That was pretty funny! Cody isn’t too bothered by thunderstorms, just the thunder but he really doesn’t run and hide. My Angel Bobo was terribly afraid, and hadn’t been until my ex-husband was holding him outside when a storm was approaching. Thunder came and that was it…….he was terrified forever after. He used to go and hide under the bed. I think the fact that you’re not afraid makes a big difference, Diane. Pumpkin, who is just short of being a year old has never showed severe anxiety of storms, but has always perked her ears at thunder and gave me the “what was that, mom?” look. Today there was a pretty large storm that went through where I live and while I wasn’t home, a friend of mine who she is accompanied to and has no problems with was home with her and my other 1.5 year old cat, Aspen. When I got home after the storm passed, we couldn’t find Pumpkin for about 20 minutes of searching (she didn’t even come to food pouring in the food bowl which is absolutely unheard of). 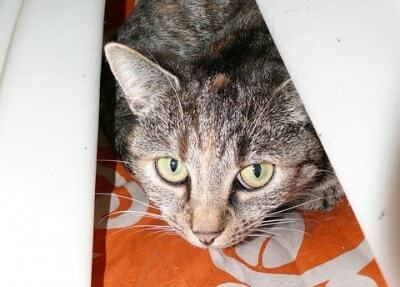 When we did find her she was hiding between the mattress and the wall and spooked to say the least. I picked her up and carried her through the house to make sure there wasn’t something specific that she would respond to, I also had my friend that was here pet her in front of me to make sure that there were no accidents and that Pumpkin wasn’t afraid of her for some reason. The storm passed about 4 hours ago, but she has been skiddish and alert and constantly staring at the door out of my bedroom or hiding since we found her and she is currently laying between my legs under the covers, jumping at every noise or movement. I know this is a long shot but if you or any one else who sees this comment has any suggestions or ideas about what’s happening, it would be greatly appreciated. It’s possible that something else happened concurrently with the storm that spooked Pumpkin, or that the storm was just more severe than anything she had experienced. If you’re open to holistic remedies, you may want to consider Stress Stopper http://www.spiritessences.com/product-p/stress-stopper.htm&Click=4413 and possibly Trauma-Free for her to help her recover from this episode. I would also use Stress Stopper prior to any future storms. Even though they didn’t bother her in the past, that may have changed after yesterday’s storm. I guess I really lucked out on my kittens. Steeler was never bothered by thunderstorms. Now these 4 pay no heed to them. They will sit on the kitty trees or in Freedom’s case on the window sills during storms. I have seen Freedom get a slight spray of the rain on her and all she does is groom herself with the little dampness she gets. I think the little ones truly react to the human factors in storms. I could care less about the noise and all that goes with it. So they have no stress to pick up on. I am one of the lucky ones that way.